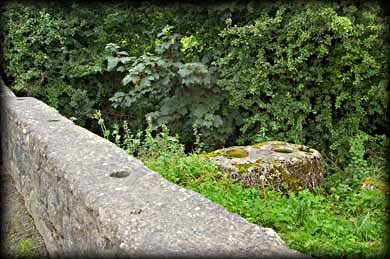 The huge granite bullaun stone at Clonmore is located in the corner of a field next to a river. The stone is about 1.8 metres in length by 0.85 metres wide. There are three large bullauns, each about 30 cms in diameter and each approximately 15 cms deep. There also appears to be the beginnings of fourth bullaun. 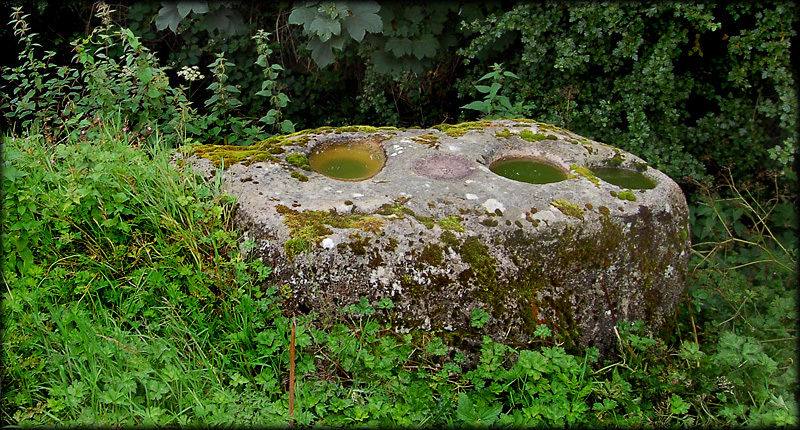 The purpose of bullaun stones and their presence at a large number of monastic/early christian sites has always been a subject of debate, but it is generally believed they were used for pounding grain. Situated: Easy. From the monastic site at Clonmore head west back along the road towards the bridge near the holy well. This amazing stone is in the field on the left. Look over the bridge. Discovery Map: 62 S 962761. Last visit August 2010.